It started when I was young, our family didn't have much money so we never ate out and I was a super picky eater, when we would have dinner and I didn't like it my mom would always say "well then fix yourself a PB&J but you still have to eat your veggies" I hated vegetables . 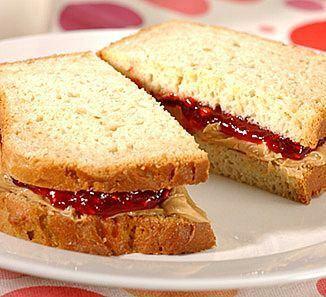 So in elementary school I brought lunch and since I was picky it was always PB&J (JIF crunchy PB and Strawberry jelly) and this was true all the way through high school. Peanut Butter and fluff AKA fluffernutter bezt sandwich. But CC isn't protown as town. 100% real heuristic. why cut? all those precious crumbles right? I am a no cut guy, that was a picture I found on google. Darnit, I needa make one now! pb, honey & banana is pretty good and pb + cheese works. I got a jar of extreme crunchy...I opened it up and it was just peanuts. That was extreme, trying to spread that. I prefer Peanut butter and banana. I just had PB on toast, my bread and "butter" so to speak. You and QuanticHawk can eat your Croque Monsieurs and room temperature chocolate milk together.